Lovely, Lovely, Alena!! I love the scrapbooking layout and the way you used the stamps on it! And that card is simply breath taking!! I love your creativity! Great stuff, here! Love the elegance in your creations! So lovely! I have the Cricut Expression 2. Looking at the Create and the Cameo...hmm, which is best? I have a Silhouette Cameo and the Vangabond. I use the Vagabond a lot. Still trying to learn the Cameo. Love the easel card. So pretty. What lovely creations! How sweet of you to create these for a cousin of yours! Looks like a beautiful celebration. I love your card and the details on it!! Thank you for your support and for sharing the beautiful creations! Perfect set for that special occasion. Love the delicate - ness (is that a word??) Layout is gorgeous and the card is beautiful.. awesome job. 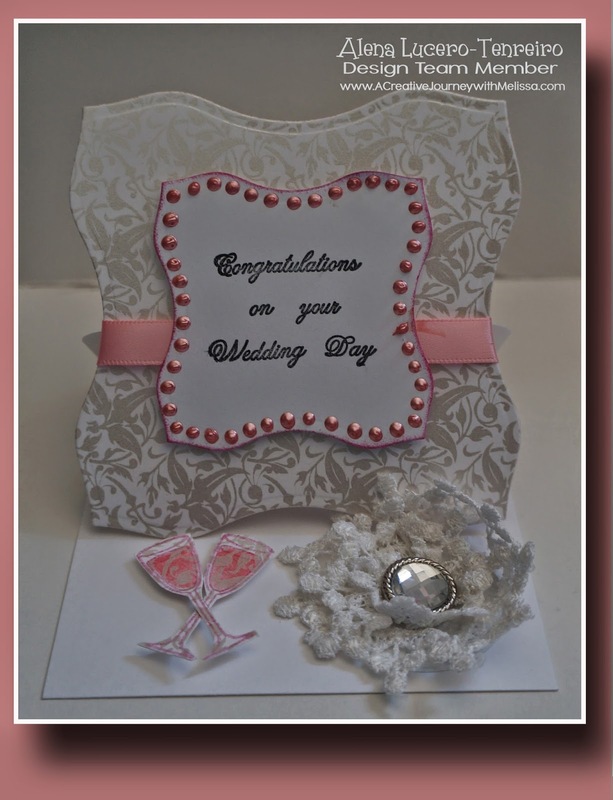 Pretty wedding layout and the pink on the card is great! I have a cricut basic... saving for a silhouette cameo!!! I have a Silhouette Cameo. I sold my Cricut. I have a cricuit bug and a silhouette portrait.